This article was originally appeared in The Daily Barometer on September 30, 2015. It has been republished with the author’s permission. 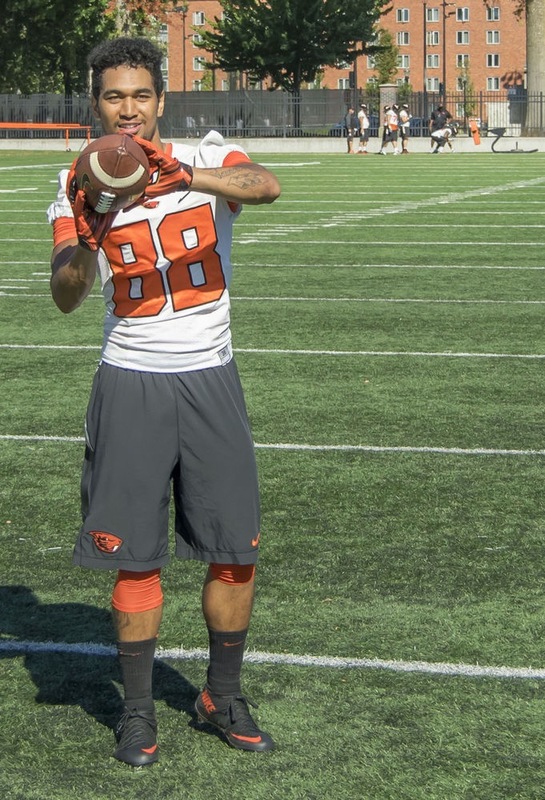 Junior receiver Rahmel Dockery found a home in Corvallis with the use of social media. Justin Strong didn’t pause very long before answering. “That boy Dock,” the sophomore safety said, referring to junior wide receiver Rahmel Dockery. The question he was answering? Who the best Snapchatter was on the Oregon State football team. Snapchat ­– a photo sharing app that many OSU athletes are active on – wouldn’t necessarily seem like an expected outlet for Dockery, who admits that he tends to be fairly quiet in public interactions. In reality though, whether on Snapchat or in person with his teammates, Dockery has made a name for himself as a team comedian. Dockery is a junior but has only been in Corvallis one year, originally starting at Washington State. Attending WSU was momentous for the Tacoma, Wash. native, since Dockery is the first member of his family to attend college. But a position switch to defensive back didn’t work out, leading Dockery to exit WSU and enroll at Tacoma Community College, which does not have a football program. Suddenly, Dockery was on his own, forced to train and keep in shape without the help of teammates or a coaching staff. For Dockery, who is fourth in the Pac-12 with 68 punt return yards this year, the connection to Oregon State was helped by junior center Isaac Seumalo, a cousin of Dockery’s. Dockery, who is half-Polynesian, noted that Seumalo and the rest of the Polynesian OSU players became his primary friend group upon arrival. Before, Dockery assumed it would be hard to fit in with his new teammates, but the transition was easier than expected. Sophomore guard Fred Lauina, who hails from American Samoa, first met Dockery on campus last year before hearing that Dockery had just transferred to OSU. “I saw his tattoos and said, ‘Hey, are you a Poly?’ Lauina said. Soon, Dockery was joining the rest of the Polynesian players at their homes for barbecues. He quickly felt at ease with his new teammates, while Lauina and the rest of the players were pleasantly surprised at Dockery’s athleticism. “He’s only half-Poly, though,” he added with a laugh. Another contrast to Dockery’s reserved public personality is his playing style, which was anything but quiet last year. His 26.3 yards per catch average led the Beavers, including a 49-yard grab against his former team and another against San Diego State. This year, Dockery’s main contribution has been as a returner more than as a wide receiver. Dockery had a 21-yard punt return against Michigan and an 18-yard return versus San Jose State, further exemplifying his big-play tendencies. His teammates were also surprised by the contrast between his mellow off-field demeanor and his electrifying playing style. Seumalo, like Dockery, also has a propensity for a more reticent public personality. Dockery and Seumalo might be the two quitest guys on the team, but Dockery insists that things are different when they’re in friendly company. Dockery’s most common form of self-expression, he happily admits, is some good-natured ribbing at the expense of his teammates. His most common target: fellow wide receiver Jordan Villamin. “He knows when he sees me on my phone that I’m about to record him,” Dockery said with a laugh. But Dockery is serious about his biggest goal in his remaining time in Corvallis: graduating. He expects to do so this June with a degree in Sociology. After that, he will likely start graduate school while using his senior year of eligibility next season. Until then, count on Dockery to do what he does best: build his social media reputation, make fun of teammates and make big plays.